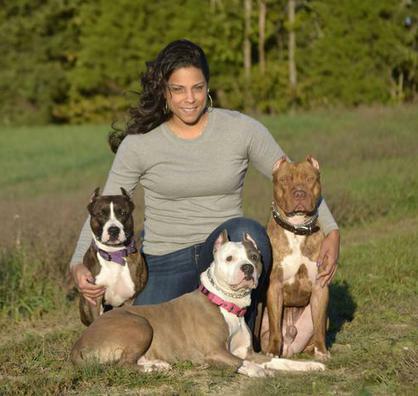 Rising Moon Kennels was established in 2000, in Anne Arundel County, MD. My name is Jamaria and I am the owner of Rising Moon Kennels. Throughout the years I've done extensive research on the American Pit Bull Terrier. I've learned so many things about the breed to include what makes them such wonderful dogs. My passion in life is to educate those who know very little about the APBT and help them see past the bad reputation society has placed on them. I was determined to show the world what a true family dog this wonderful breed can be. On October 28, 2000, I fell in love with my first APBT, Delilah. My passion started with her. She was my first conformation dog with United Kennel Club (UKC). About 2 years later, I got my second APBT whom I entered in conformation shows as well. From there, I entered in obedience and rally classes that helped build my skills as a handler, increased my dogs body awareness, confidence, help build a foundation of skills that challenged them mentally, which manifested into seasons of competitions and title winnings. I have been raising APBT's for over 15 years and have been training dogs for more than 4 years. All of my pups/dogs are raised indoors with an abundance of love and attention. Since 2012, I volunteer my time teaching basic obedience classes. I've worked with a variety of dogs, from small to large breeds, and participated as a judge in fun matches held by Canine Training Association. I have transformed the lower level of my home into a place of tranquility and comfort for clients who prefer "in-home boarding" for their pets. If you are interested, feel free to request a "Meet & Greet" by scheduling an appointment so you can come out to my home, with your pet, and see where he/she will be staying.